I loved my Windows Home Server. Every time I needed more storage I would just buy the bigest drive I could affor and plug in it instantly expanding my storage. And then Windows Home Server 2011 came out. I read about the lak of Drive Extender but I figured it would still be good enough. It wasn’t. I really miss Drive Extender. I have 8 drives and don’t really need or want to deal with RAID so I am forced to somehow and try to manually balance the files in my shares. The problem being that my biggest hard drive in my server is 2TB and I have 3TB of video. How do I separate them? Windows Home Server was the only Microsoft product I still used because there was nothing else like it out there. Now that they removed the best feature I see absolutely no good reason to staty with Microsoft at all. I am going to have to use a RAID solution and it would be nice to use an operating system that requires less resources. The most popular free NAS operating systems I have come across are OpenFiler and FreeNAS. I have used OpenFiler in the past to provide NFS storage for my ESXi Virtual Machines but not much else. I had also heard of FreeNAS as the “not for enterprise” solution so I didn’t investigate it much. I have since revisited both OpenFiler and FreeNAS and have setup virtual environments to test each. My requirements for my NAS are as follows. 1. Sharing files with Samba must be as seamless as any Windows Server. 2. Ability to use iSCSI and NFS for ESXi Virtual Machine storage. – Ability to backup my Mac with Time Machine to the server without running any hacks on my Mac. – Can be installed to a USB flash drive. Both Openfiler and FreeNAS have all of my required features with possibly the exception of OpenFiler whose releases are very infrequent although they did just release version 2.99 this month. So how did I choose between them? I setup a complete virtual network on my ESXi server. I had a pfSense box to be used as a router and a windows XP and Ubuntu 10.10 box to administer the router and NAS test box. – File sharing: Can the client machine browse the network to find the machine or do they have to manually connect to the server? Does Guest sharing work? Does permissions based sharing work? – RAID: what happens when a drive fails? How do you replace the drive? I found Samba file sharing on both OpenFiler and FreeNAS to require a bit of work. Definitely not as easy as Windows Home Server but I did manage to get both guest and permission based sharing working on both boxes. There was a problem with OpenFiler though. When trying to access the machine by double clicking on it’s computer name while Browsing the network, it prompted me for a password. Entering “guest” worked but FreeNAS and WHS never prompted me for a password before allowing me to see all the shared folders. I am sure there must be a samba setting that would fix this but I couldn’t find it. For RAID, I found FreeNAS a little easier to setup but both systems provide the same type of functionality. FreeNAS supports ZFS and after I did some reading to learn what ZFS was I was very impressed. I found my reading on ZFS software raid being as fast or faster that hardware RAID intriguing. I next tried testing drive failures. I did this my removing the drive from the VM. I expeceted that the GUI on both systems would almost immediately show the removed drive but that didn’t happen. Upon reboot FreeNAS showed the missing drive but trying to figure out the drive was missing in OpenFiler was not straight forward. I next tried to install a new drive. Although it wasn’t clear I managed to do this on FreeNAS via the GUI and through the command line. I tried to add the new drive to Openfiler via the GUI but I couldn’t figure out how to add the new raid volume to the exisitng volume. I am sure it’s possible but don’t want to have to do a lot of research on how to replace drives in the event one actually fails. Overall I found OpenFiler and FreeNAS to be very similar and I am confident either one would work. I ended up choosing FreeNAS for the follow small reasons. 1. Samba was slightly easier to configure and didn’t prompt for password when viewing the machine’s shared folders. 3. FreeNAS is based on m0n0wall. I use pfSense for my router/frewall and it is also based on m0n0wall. Last March I wrote a post about PowWeb’s Secret Price Increases. Well, I just received my latest invoice from them for my 2011 hosting, and guess what? Same story. They charged me $107.40, which works out to $8.95 per month. The regular price shown on their homepage is $7.77 per month. At that rate, my bill should have been $93.24. I must admit this year’s bill is slightly better than last year’s, when they tried to charge me $111.24. But still, it’s a far cry from the so-called regular price they advertise. I immediately contacted PowWeb support and requested that they either bill me the correct amount or update their homepage to reflect the price they charged me. They chose to correct my invoice, as they did last year. And I have no doubt I’ll be placing the exact same support request next year. As far as service and hosting reliability goes, PowWeb performs well for a shared host. Even so, that does not excuse these secret price increases. I could understand if they charged more for added features. Even if they decided to jack up their prices for no reason, I wouldn’t complain if they at least had the decency to inform their customers of the increase. But keeping an inaccurate price on their homepage year after year and hoping customers won’t notice the discrepancy? That’s just wrong. I would recommend to anyone who is hosting with PowWeb that you check your invoice carefully. If you’re being charged more than $93.24 ($7.77 per month) contact support and tell them to charge you the correct amount, as shown on their homepage. You shouldn’t have to pay more. I know I haven’t blogged since August but I have a good excuse. My team and I have been working really hard towards the public beta release of our new online wish list app Wishing Wagon. Basically, Wishing Wagon allows you to create lists of items you would like to receive for a special occasion like Christmas, birthday, wedding, etc. The advantage of Wishing Wagon over other store-based wish lists is that we aren’t store-based. You can add any item you want from any online or physical store. Since my blog is primarily about technical topics and I’m not sure if promoting my web app can be classified as a miscellaneous rant, I’ll talk a bit about the architecture of Wishing Wagon. The site was built using PHP and of course my favourite PHP framework, Zend Framework. For the database, instead of MySQL, this time we decided to use Couch DB. I must say that using documents instead of using relational databases feels so much more natural. Documents fit much better with models and I don’t have to worry about Many-to-Many relationships anymore. Couch DB took a bit of time to get used to, but I am now hooked and will try to use Couch whenever eventual consistency is an option. During the development of Wishing Wagon, I’ve also come to appreciate the built-in Amazon API support in Zend Framework. Retrieving products and searching for items is a breeze. I was a little surprised at how easy it was. The site is hosted on Rackspace Cloud and is load balanced using HAproxy. We use Rackspace Cloud files as our CDN and we use the Compass Rackspace Cloud Files Zend Framework Library to upload files to the CDN. I’ll try to blog a bit more about our development experience in the next few weeks. Don’t forget Christmas is only 45 days away! Why not create a Wishing Wagon and add some items? Oh, and did I mention it’s free? When I lived in Hamilton, I used Mountain Cable (now Shaw) as my Internet Service Provider. The service was excellent, very fast and there were no usage limits. I could download hundreds of gigabytes per month and no one cared. I have since moved to Kitchener and been forced to be introduced to the wonderful world of Rogers. I should note that I dislike Bell and anything Bell-related, and that I’ve never had a positive experience with DSL. So Rogers high speed it was. I signed up for the Rogers Extreme plan which includes 10 Mbps down, 1 Mbps up, and 95 GB of usage. I was a little concerned about the internet usage limit, but I wasn’t worried because I also noticed that additional usage was billed at $1.50/GB to a maximum of $25. $25 more for unlimited internet? Sounds good. I generally was under the 95 GB mark, but if I went over I made sure I went way over to justify the extra charge. Unfortunately, at some point without my knowing it, Rogers increased the maximum additional usage charge to $50, which means my total internet bill could be over $110. That’s too high for me. I noticed Rogers had 2 more faster plans available: Extreme Plus for $69 (25 Mbps/1 Mbps/125GB) and Ultimate for $99 (50 Mbps/2 Mbps/175 GB). I figured I would just upgrade to the Extreme Plus and pay $10 for an extra 30 GB–that should be enough, I thought. I phoned up Rogers and upgraded my plan. I was a little unhappy that I was told I would need a new modem to take advantage of the faster speed, but I was more concerned with the extra $7 per month I’d have to pay just to rent the thing. Also, the new modem was actually a Wireless N gateway. That’s nice, but I already have a wireless N access point and use pfSense as my router/firewall. I was not impressed, but I figured the exta GB and 25 Mbps down were worth the inconvenience. 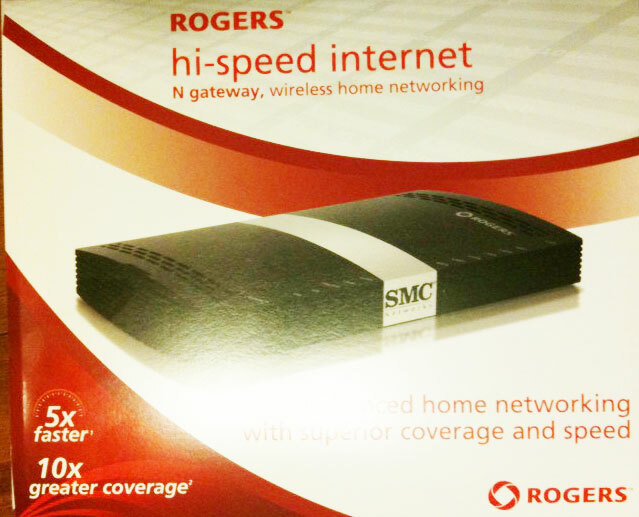 The next day, I went to the Rogers store and swapped my modem. I also decided that I would purchase the new modem instead of renting–it would be paid for after 28 months of paying $7. I took my new modem home and set it up. The first thing I did was log in using the mso credentials to disable the gateway nonsense. I’m very glad they let me do that, although it’s a waste because I just paid $199 for features I’ll never use. It was really easy to set up. Once the gateway features were disabled, pfSense was able to get my public IP from the modem instead of the 192.168.0.10 address it had previously been assigned. I then excitedly went to speedtest.net and ran a speed test (see below). I’m about 15 Mbps short…? …hmm, that’s nice, I thought, but I’m paying for 25 Mbps. I ran it again, and again, and then tried the official Rogers speed test, plus a bunch of other ISP speed tests and even thespeedtest app on my iPhone. Each showed very similar results. None would go over the 10 Mbps barrier. I knew it was incredibly unlikely that a busy network would give me these consistent results and I knew that being so close to 10 Mbps couldn’t just have been a coincidence, so I called technical support. I actually was going to use the live chat technical support, but when I read the disclaimer about closing windows on your computer that you didn’t want the tech support guy to see, I immediately picked up the phone. I’m probably more qualified than most of the tech support at Rogers, so there’s not a chance I’d let some newbie touch my precious Mac–assuming they even support Macs. Tech support was helpful and figured out my problem right away. The genius that upgraded my account the day before hadn’t checked properly to see if the DOCSIS 3 was installed in my area yet. It wasn’t. The tech support guy said it should be coming in a few months but couldn’t promise anything. Wonderful. I asked the tech guy if I could keep the Extreme Plus on the old speed, but with the increased usage limit of 125 GB. He said that I could not officially be switched to the new plan until DOCSIS was in my area, so I was stuck with my 95 GB limit. Although I was unhappy about this, the tech support guy was nice and friendly and answered all my questions fully. He then transferred me to customer service so I could downgrade my account. I must say the customer service representative I spoke to was one of the best customer service folk I’ve ever encountered. She was very friendly and helpful, and instead of the typical silence one experiences while the representative types away on a computer, she told me exactly what she was doing and why. I greatly appreciated her friendly approach. To compensate me for my inconvenience, Rogers gave me a $5 goodwill credit–which will barely dent my additional usage fees for the month, but it’s better than nothing. Anyway, I’m on the right plan now and will probably try upgrading to Extreme Plus again when it’s available in my area. Apparently I’ll know when that happens because I will be “bombarded with marketing” according to my friendly Rogers customer service representative. I don’t doubt it. 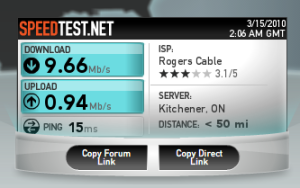 Overall, I am happy with my Rogers service. It’s always super fast (even at 10 Mbps), my 3rd party VOIP works perfectly, and I’ve always had a good experience with Rogers customer service. I just wish the sales guys would not sell services to customers that they can’t use. Oh, and it would be great if Rogers offered a cheap DOCSIS 3 compatible modem with no gateway functions. I love my iPhone. I don’t have to fight with it or coax it to perform even the most complicated of operations. It doesn’t crash. Unlike any other phone or PDA I’ve ever used, the iPhone does everything Apple claims it can–and it does it well. 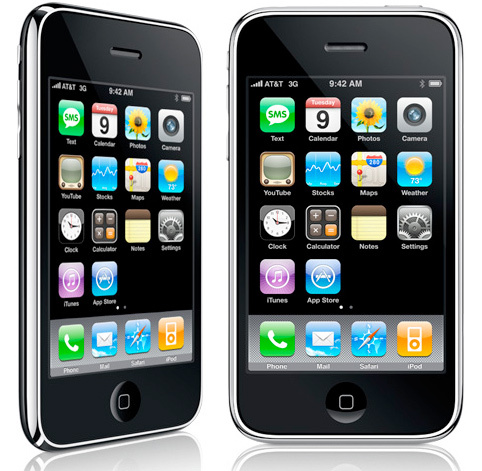 If I had to choose one word to describe the iPhone, it would be simplicity. Ignoring the impressive internal hardware and attractive aluminum exterior, the iPhone is a relatively simple device. It has practically no hardware buttons to confuse the user. There are no complicated start menus to access to check your email. You just turn it on, swipe your finger and choose an app. When I first played with an iPhone I was confused. Not because the iPhone itself was complicated but because my brain was used to complicated menus. I’d been a Windows Mobile user for many years and it took me a few minutes to realize that were no x buttons to click. No windows to minimize. No multilevel dropdown menus to traverse. To get back to the home screen I press the single front hardware button. To navigate through an app, I lightly touch logically placed blue navigation buttons. It’s an absolute pleasure. Oh, and it’s fast. My last phone was an HTC Touch. I had to overclock it to make it remotely bearable. I’m proud to say that I’ve been an iPhone user for over six months, and I still can’t seem to find any significant faults with the device apart from perhaps slight annoyances. Batter life on 3G is acceptable, although certainly not great. Years ago, I got myself into the habit of charging my phone every night, so this is not really a problem for me, but if I do heavy 3G usage during the day my phone is under 50% by the time I put it in its dock for the night. With 3G disabled, the battery will last probably twice as long. Is there a phone out there that has better battery life? Probably. Does it do as much and can provide as good as an experience as the iPhone? I sincerely doubt it. I refuse ever to get a device with a Blackberry-like keyboard. My phone is not just an email device. There are plenty of apps that don’t require a keyboard, so why would I want one staring me in the face when the phone’s precious real estate could be used by, oh, I don’t know… a bigger screen? I love the iPhone’s on-screen keyboard. I’ve had several Windows Mobile devices over the years and I got used to tapping keys with a stylus. I was very impressed by how easy it actually is to type on the iPhone’s screen with my thumbs. It’s very intuitive; it can figure out pretty well exactly what I am typing, and I can get a pretty decent speed. It’s much faster than using a stylus. Everyone talks about the iPhone’s lack of multi-tasking. Ok, it’s a valid point: The iPhone does not have true multi-tasking. But is that something I really need on my phone? Is my phone experience lacking because I can’t quickly switch between applications? Do I really need to do more than one thing at a time on my phone? The answer is no. It’s a phone! I know that’s a poor excuse, but it’s a valid one. On a desktop computer, I usually have at least 10 windows open at any given moment and at least 15 or so tabs in my web browser. Do I miss multitasking on the iPhone? No, I don’t. If I want to switch between apps on my iPhone, I press the home button and choose my next app. Some apps remember where you left off, so in a way you get pseudo multi-tasking (in the application switching sense of multi-tasking). I can still have my multiple web browser tabs in Safari. Would I like multi-tasking on the iPhone? Sure. Will I buy another iPhone even if it still doesn’t have multi-tasking? Definitely. 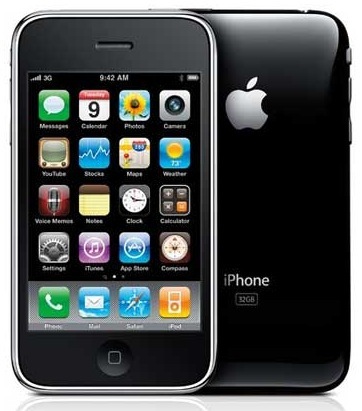 My only regret related to buying an iPhone is that I had to settle for a 16GB model because there weren’t any 32GB 3GS models in stock when I bought my phone. I saved $100, but would rather have had double the space. The iPhone is simply amazing. It’s the ultimate smart phone. Once again, Apple has come up with another incredible product and I can’t imagine what features the next iPhone will have.